LinkedIn marketing is unique in that it offers an almost direct approach to marketing, taking away much of the guesswork associated with Facebook marketing campaigns and allowing for insights we may never have been privy to without the LinkedIn platform. Another unique aspect of LinkedIn marketing is having access to market efficiently in a B2B environment; we’ve collated the top 5 videos to help us understand savvy tips, insightful advice and most importantly, develop an effective B2B marketing method we can adapt to our own campaigns on LinkedIn. 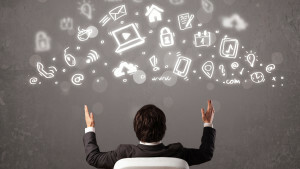 B2B Marketing on LinkedIn – What Is It? 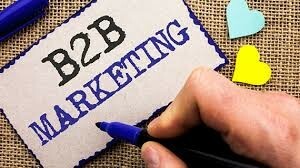 “As the name suggests, B2B marketing refers to the marketing of products or services to other businesses and organizations. It holds several key distinctions from B2C marketing, which is oriented toward consumers. Any company that sells services or products to other companies will classify as B2B. B2B marketing campaigns are aimed at any individual(s) with control or influence on purchasing decisions. This can encompass a wide variety of titles and functions, from low-level researchers all the way up to the C-suite. The not-so-old adage that “the best place to hide a body is on the second page of Google” has proved itself true; we simply took 5 videos from our search for B2B marketing strategies and we’ve struck gold. This insight may also help us understand the importance of video content as a backbone (although hardly used) to a successful online presence – something any marketer needs to keep at the forefront of their priorities. While video content may not assist directly with our B2B LinkedIn marketing, it does allow for user experience bolstering, authoritative and trust-building as well as a general, well-rounded online presence – something essential in our modern times. From Marketing 360 – currently sitting at just under 205 000 views – the video below helps us learn 8 Reasons B2B marketing on LinkedIn is the place to be in 2019 and beyond. “1) Nearly 500 million professionals listed. Essentially nearly every major player at each legitimate business is listed on LinkedIn. 2) Target professionals with pin-point accuracy – Industry, Company Size, Company Name, Job Title, Job Function, Job Seniority, Years Experience, Schools, Degrees, Fields of Study, Skills, Age, Gender, Location/Geo-Targeting and even LinkedIn Groups which people join based on various topics. 3) Example – say you sold a product or service to business owners of contracting companies over 20 employees located in Colorado. You could target exactly that and run your ads. 4) Sponsored content ads – which shows up in people’s LinkedIn feeds and various places like LinkedIn groups based on your targeting (can have articles, images, videos, etc..). These have the ability to drive somebody to a landing page or submit a pre-populated Lead form instantly. Charged per click, generally $5-$10 per click. We’ve seen 10-15% conversion rates making the cost per lead around $50-$100 per conversion. 5) LinkedIn Inmail – more intimate connection. Sent to people’s LinkedIn Inmail box and email with chance to reply/connect to your message or call-to-action. Charged per send. Generally around $10-$15 per send and can have a high conversion rate with a good message. As high as 20-25%. Cost per conversion ranges between $50-$100 on average. 6) LinkedIn Display & text ads – banner ads through platform shown to targeted audience. 7) LinkedIn Retargeting ads – setup pixel on your website to capture website visitors and tell LinkedIn who’s in your list to advertise to. 8) Can set daily budgets and lifetime budgets to stay within budget. RevGrow sheds more insight in this video (https://revgrow.com/4-tips-leveraging-relationships-linkedin-b2b-marketing/) – detailing how the KYC principle is still relevant in any form of marketing – moreover a LinkedIn B2b campaign. While this first “tip” may seem intuitive, it is often neglected. Market and build relationships with those who matter to you and for your business. LinkedIn offers a variety of tools to explore potential connections’ industries. Finding commonalities can be essential to alleviating any potential awkwardness when making initial connections and can also be an effective means to discover the ways in which connecting can be beneficial to both of you. According to LinkedIn Business, 90% of the leads coming from LinkedIn are high quality, qualified leads. Their high-level professional titles, the years of experience they bring to the table, their education, and the amount of people working for or with them are all great reasons why these people are highly qualified and on LinkedIn ready to do business! Also, look to your competitors. Connecting with people on LinkedIn who are potential competitors gives you access to their LinkedIn network so that you can target the same people. 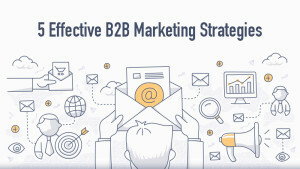 2) Develop your LinkedIn B2B marketing and messaging strategy. After you’ve researched your target audience and connected with them, it’s time to start messaging and marketing, which is incredibly important. As RevGrow has mentioned before with regards with developing a LinkedIn B2B marketing and messaging strategy, the three items below are quite crucial to take into consideration. Remember, when it comes to defining your objective for your messaging strategy, you need to know who your target audience is, know what you’re looking to gain, and know what actions you want your potential client or customer to take away with. Using and sharing the right kind of content can help when it comes to marketing and building relationships. The more people who read your content and engage with you, the quicker you will begin to see the results you are looking for in your business. Advertising is another great tool to use to target your audience. You can use paid advertising or simply advertise to your current connections by posting valuable content to your personal profile feed or company page. In your personalized LinkedIn messaging, be clear why you are requesting to connect and the value it could hold for both of you. Be concise with your message, avoid rambling, and be consistent with your belief that a connection is beneficial to both of you. If a message goes unanswered, it’s okay to follow up with a gentle reminder. The relationships you build and maintain are actually your most valuable asset. It’s not your product or service, it’s not your profits, it’s your relationships! Strong connections are not built overnight. They require time, energy, and focus – and you shouldn’t wait until you need something to reach out. Communicate effectively, give referrals, provide value and feedback. Come up with reasons for both of you to stay in touch – be creative and have fun. 4) Add value and be creative. Adding value to your LinkedIn connections goes beyond conventional advice. Simply sending messages every month or opting them into your company’s email list is not good enough. Again, here’s where research can help. Utilize commonalities and seek out ways to help others by sharing content, engaging with them on LinkedIn, and building relationships over time. These are the sort of out-of-your-way gestures that can genuinely strengthen relationships – and you never know what surprising benefits could result. So until this point, we’ve gotten some great tips from experienced marketers on what type of formulation to use to make your LinkedIn strategy a success. Being in marketing, however, we know there is no tool as powerful as social proof. LinkedIn Business has taken 5 exceptional marketing strategies from some of the world’s most successful brands, and given us real life testimony on how these brands leveraged accurate, concise and creative copy for their target markets. Influencer marketing might bring to mind images of celebrities hawking vitamin water or makeup kits to their millions of followers. But B2B influencer marketing is different. It’s not about getting the influencer with the biggest audience; it’s about finding those who are most relevant to and trusted by your target audience. Bosch Power Tools used micro-influencer marketing to reach their target audience without breaking the bank. They needed to convince tradespeople to upgrade their tools — a group that is historically skeptical of new technology. To make their case, Bosch provided tools to volunteer testers, encouraging them to create video reviews. These videos became the base for a campaign that included social media mentions and placement of reviews in trade publications. All told, the authenticity and humanity of their micro-influencer videos helped Bosch exceed their benchmarks for reach, engagement, and conversions. People prefer to buy from brands that they perceive as sharing their core values. Consumer brands like Lush, Tom’s, and Bombas have built their values into their business models and have seen impressive success. B2B brands can be hesitant to take a bold stance with their purpose. This can be from fear of alienating potential customers, perception that their buyers only care about their product (not their values), or both. Deloitte is a stellar example of how taking a stand can earn the right kind of attention from potential buyers. This video for their Global Impact Report makes their stance crystal clear. This type of thought leadership has helped Deloitte accrue more than 3 million followers on LinkedIn, with thousands of views and hundreds of comments on their LinkedIn Page posts. Everyone loves a story about the small-town guy or gal who makes good — and B2B buyers are no exception. Barclays could have written a dry case study about Low Cost Vans, a small business that sponsors their local football club. Instead, they focus the story on Low Cost Vans’ Managing Director, Rod Lloyd. The video doesn’t start with a history of the company, or of Barclay’s involvement with the company. Instead, it starts with, “I think every young lad has a dream of playing for your local club. My dream as a child was to play with Swansea City.” Barclays does convey what they do for small businesses, what their values are, and how they helped Low Cost Vans succeed. But the story is far more effective, even emotionally moving, because it’s told at a human level. Humor has long been an integral part of B2C marketing. In particular, there’s a type of snarky irreverence that brands like Wendy’s and Moon Pie have used on social media to great effect. B2B brands, while experimenting with humor, tend to play it a bit safer. A cautious approach does make sense for most brands, but there’s still value in pushing the envelope. Freelance coordinator Upwork went all in on irreverent humor for their “Hey World” campaign, which combined bold color and design with cheeky call-outs to NASA, the President, Dwayne “The Rock” Johnson, and many more. Upwork ran an impressive integrated campaign, repurposing the assets for 15-second commercials, billboards, ads on public transportation, and more. Their willingness to court a little controversy with irreverent humor translated to increased visibility with their target audience. Video production has gotten cheaper in the past few years, but it’s still one of the most resource-intensive types of content. Despite the level of investment, video is a must for brands in B2B and B2C. Consumers are watching more video content than ever before, and that includes C-suite level members of buying committees. The latest campaign from WeWork is a good example of how to squeeze every bit of utility from your video investment. The company created a series of 30-second videos illustrating how small businesses can level up their office space. The videos were designed so they can be cut to 15 or even 6 seconds and still get the message across. WeWork used the videos in their native form, as YouTube pre-roll ads, and embedded natively on social networks. They were even able to create gifs from the video and use them as social media images. Now that we have the basic B2B LinkedIn Marketing strategies set out with some prime examples of a job well done, why not start brainstorming your next B2B campaign? Full credit goes to all cited sources in each segment.